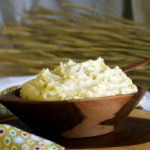 Buttery Yukon Gold potatoes are whipped with generous amounts of cream cheese and butter for super creamy mashed potatoes. Fill a large saucepan about halfway with cold water. Add the potatoes and 1 tablespoon of salt. Set over medium-high heat and bring to a boil. Let the potatoes simmer until they are fork-tender, about 15 minutes. Heat the milk, half-and-half, or buttermilk in the microwave or stovetop until little bubbles appear around the edge. Drain the cooked potatoes in a colander set in the sink and immediately dump the potatoes over the butter and cream cheese. Let stand for 5 minutes to allow the butter and cream cheese to melt. Add 1/2 tsp salt and pepper to the potatoes, fit the mixer with the paddle attachment, and begin to mix on the lowest speed. Add the milk, buttermilk, or half-and-half slowly, adding only what you need to achieve the consistency you desire. You might not need to add the entire half cup. Taste and add more salt and pepper if desired, and serve. To use a ricer or food mill to mash the potatoes, melt the butter and cream cheese in a saucepan set over low heat. Push the potatoes through the ricer or food mill, slowly stir in the butter and cream cheese, then slowly stir in the milk.